The energy storage market is kind of like the Loch Ness Monster — It’s rarely seen. It’s said to be huge. And many think it’s not real. If you’re like us, you have dozens of articles and reports on energy storage (and other topics) starred for reading later. But “later” never seems to arrive with the free time you needed to read about this high potential market. As such, we’re providing this “Cheat Sheet for Energy Storage Finance” based on our work as buy-side and sell-side investment bankers experienced in both energy storage venture capital and project finance. Thanks to Greentech Media, GTM Research, Utility Dive, Bloomberg New Energy Finance, Bloomberg, McKinsey & Company, i3 (Cleantech.com), Lazard, Energy Storage Association, PV Magazine, Rocky Mountain Institute, Renewable Energy World, and Energy Storage News for their great work that helped us compile this research. Big picture: The rise of energy storage is expected to mirror the giant leap that the solar sector took between 2000 and 2015 (link). For those of you who rode the solar roller coaster like we did, you might want to get that amusement park seatbelt and whiskey ready. You may need them. We’re just in the first inning of this game. And for a guy who prefers basketball (born in Kentucky and living in North Carolina), that’s saying a lot. There’s little doubt that Stem has been the big winner, with almost $300M invested to date. With its focus on artificial intelligence, aggregation of distributed batteries, and managing demand charges for commercial customers, it makes sense. We’ve also seen a host of energy storage companies get gobbled up by bigger giants eager to get a headstart in the battery game. Enel bought Demand Energy. Wartsila snatched up Greensmith. And Aggreko consumed Younicos. See a longer list here. No one knows what other innovations will make it to market, but we can guess that they will make storage easy and beautiful, take advantage of multiple revenue streams, serve more than one customer, and be loved by utility giants for the grid problems they’ll help solve. The scale of investments in energy storage project finance will continue to dwarf venture capital investments in the sector. It’s also worth noting that non-recourse financing -- i.e., no corporate or personal guarantees necessary — is on the way. Three big project developers have won this unique benefit of the project finance model: Powin | RES | Green Charge. Revenue certainty -- “Show me the multi-year contract.” — Revenue has often depended on a spot market (e.g., ancillary services in the PJM market). But investors need the kind of 10-year capacity contracts available in some parts of California. Revenue diversity -- “Are you ‘stacking benefits’?” — Energy storage projects are unique in their ability to serve multiple masters. However, technology, warranties, policies, and investor requirements (e.g., covenants in loan agreements) often limit projects’ opportunities for multiple revenue streams. Technology bankability -- “Lithium is king: 95% of the market.” — Surprise! But it’s still easy to be confused by the 70+ battery technologies out there and their tempting “shiny object” headlines, like electronic sirens in a modern day Odyssey. Strong warranty -- “How big is your balance sheet?” — Big vendors like LG Chem, Samsung, Panasonic, and Tesla have enough data to provide performance and full-wrap warranties. It’s easier for the buck to stop at these behemoths than at an exciting new startup. Creditworthy offtaker -- “Will I get paid?” -- It’s not unique to energy storage, but the number of offtakers that want energy storage solutions is much larger than those with long credit histories and strong credit ratings. But as you know, the lack of the latter is not the same as a high risk project. Scale -- “Is the sector big enough to be worth my time?” — If it’s too niche, mainstream investors won’t touch it. But things are changing quickly on this front. Backup power — “That’s a nice psychological benefit. But there is no real ROI.” — Most residential batteries are sold for backup electricity. However, solar self-consumption and the provision of grid services are two additional ways for these systems to generate stronger ROIs while also providing resilience for the 1% of the time that there are grid outages. If you’re looking for a Blue Ocean Strategy play in clean energy, something with few competitors and new customers, then the time is nearing when you might be late to the party. But don’t run away crying and defeated just yet. With $100B of expected investment in the sector over the next 12 years, “the cup runneth over” with opportunities, whether your cup of tea be VC-stage innovation with hundreds of possible winners to choose from, or perhaps project finance targets for lower risk and much bigger capital deployment. Shout out to Thomas Kelley for the cool Volts photo. ​It’s easy to assume that the energy storage market is plagued with technology risks. In this post, I will call out 7 factors that are projected to make lithium-ion batteries the top energy storage technology through at least 2025. This dominant type of battery is a leader in part because it is not defined by just one type of chemistry. So, the math is not quite fair. Many of these versions of lithium-ion batteries actually compete amongst themselves. Lithium-ion batteries include varieties with cobalt oxide, manganese oxide, iron phosphate, nickel manganese cobalt oxide, nickel cobalt aluminum oxide, and titanate (titanium oxide). Use cases for this smorgasbord of lithium-ion options cover areas of great interest to us at IronOak Energy Capital — such as grid services, demand charge reduction, and EV uses — as well as non-power sector applications such as medical devices and power tools. For more, here’s a good summary from Investing News. Lithium-ion is about as innovative as a middle-aged person. With roots in the 1970’s, lithium has gone from science labs and discussions of the distant future to billions of dollars of investment and global dominance. The next biggest player was vanadium flow batteries with 3% market share. ​With each additional quarter of lithium’s leadership, the whole host of market players becomes more comfortable with the technology, from regulators and developers to investors and suppliers. In addition, each year their performance continues to increase. As such, competitors to lithium face a moving target, one where the bar is constantly rising. With dozens of lithium-ion competitors trying to win over technology investors, they each receive less capital than they need to scale quickly. Lux Research notes that “beyond lithium” battery companies raise an average of $40M over 8 years. Compare this to the $5B invested in Tesla’s Nevada Gigafactory. Or the three additional gigafactories they announced in February of this year. 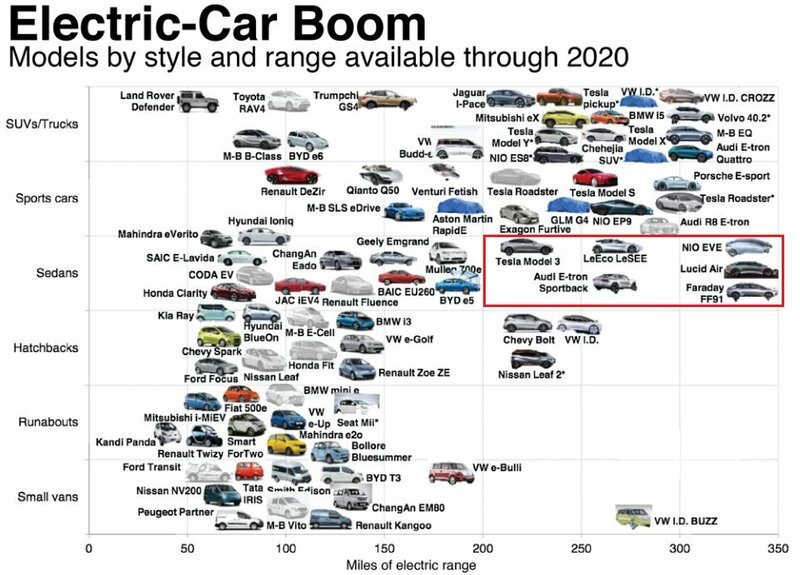 In addition, this trend is happening outside of Tesla’s magnetic media coverage. Experts suggest Tesla’s factory is only 1 of 12 such factories around the world. In Asia, Amperex Technology, Panasonic, LG Chem, and Boston Power are all planning new lithium factories in China. And Samsung and BYD plan to expand their existing plants. Startups are known for innovation, being nimble, and disrupting 800-pound gorillas. While exciting, those are also correlated with company-level risk and balance sheets that leave something to be desired. So, if you are the developer and investor in a large stationary battery installation serving the power grid, or the global manufacturer of thousands of electric vehicles, do you choose an innovative startup or an 800-pound gorilla to supply your batteries? Yep, you guessed it. Big and boring wins the day when it comes to scale. As an imperfect proxy, think of large market capitalizations — Samsung ($254B), Panasonic ($26B), LG Chem ($18B), or Tesla ($57B). It reminds me of another grim expression: “I want just one throat to choke.” If something goes wrong with those batteries years down the line, you want to be able to … well, you get the idea. With its considerable inertia, the lithium-ion battery market is expected to continue leading the battery market through at least the next decade. It’s worth noting that some lithium competitors may have stronger Compound Annual Growth Rates than these projections imply. However, they are starting from a much smaller base so percentages can be deceiving. In terms of known global lithium reserves, the U.S. has roughly 0.3%. That’s not so great when projections suggest $1.4T of U.S. infrastructure could be underutilized over the next 15 years without feasible energy storage solutions. It can also be a limiting factor when electric vehicles hold the keys (yep, bad pun) to managing grid stability as renewable energy penetration grows. As an example, consider that California, the sixth largest economy in the world, is eyeing a new 100% renewables target by 2045. Accordingly, U.S. national laboratories are on the hunt for lithium alternatives. The most notable initiative is Joint Center for Energy Storage Research (JCESR), an innovation hub based at Argonne National Laboratory. So, what is their latest conclusion after considering dozens of next generation battery technologies? Well, one of the two is still based on lithium — that is, lithium-sulfur batteries, which are lighter and have greater energy density than today’s lithium-ion versions. 7. Will Lithium Popularity be Its Demise? You have undoubtedly seen articles suggesting that lithium is a rare metal whose availability will be entirely consumed by Tesla’s Gigafactory. OK, now forget all of that. Let’s talk about the difference between lithium reserves vs. resources. Quiz time: Fill in the blank. _________ stand at roughly 14 million tons. _________ are estimated at 40 million tons. So, which is reserves and which is resources? Duh, right? Resources refers to the lower, much higher number. Reserves applies to the upper, lower number. Moreover, the volume of resources should continue to climb higher as projected future demand for lithium entices companies to invest more in exploration. Now consider some wild numbers from Mr. Musk: The world could be powered 100% by clean energy if we had the storage capacity output form 100 gigafactories. If true, and if you assume that the full volume of resources is static, then experts suggest we would still have enough for 50 years of lithium supply. All in all, no one can predict the future. But it’s nice when many prognosticators are saying similar things: Lithium batteries make up 97% of new installs in the U.S. (and similar dominance globally). In addition, the seven factors above suggest that its market appeal is likely to continue into the foreseeable future. That said, lithium-ion batteries are not perfect. For example, their maximum duration is four hours of storage. Yet experts suggest that in the years ahead power markets will demand longer duration batteries that allow for over four hours of capacity. Some even call for seasonal storage — think multi-month capacity. And lithium batteries are also not perfectly scalable. So, a 5x increase in size may not mean a 5x increase in power, as would be the case for a flow battery. But keep in mind that the perfect is the enemy of the good when it comes to controlling market share. Enthusiasm around the energy storage sector is more feverish than ever. This is simultaneously encouraging and concerning. Is the battery technology ready for large-scale market deployment? Which ones? Is energy policy ready to reward battery owners for the benefits they provide behind the meter (i.e., demand charge cost reduction for building owners) and in front of the meter (i.e., grid capacity and frequency regulation)? Are storage companies’ balance sheets strong enough to backstop potential problems in the field over a 10-20 year period? Is this a winner-take-all game, where 90% of investments in storage technology return zero capital? Is there enough deal flow to match growing investor appetite, and if not, what does that mean for the underwriting done on today’s investment prospects? Despite such rationale thinking, many investors want in on the action. Consider the statistics below from the website AngelList, a trusted resource for angel and venture capital investors. Technology — both software and hardware — are today’s investment focus. As such, angel and venture capital investors drive this discussion. Given the industry’s youth, examples of infrastructure investment in this sector are hard to find. However, energy storage projects, not technology, will receive the vast majority of capital in the years to come. Let’s look at two examples of investors deploying capital for battery project finance. The table below is compiled using data from the good folks at GreenTech Media and Crunchbase. As the costs of batteries continue to fall roughly 10% per year, and as technology performance and warranties improve, more debt and infrastructure investors will get into the game. Bloomberg’s graph below illustrates how fast prices have fallen for batteries used in vehicles. Said differently, regardless of where an individual, investor, or company stands on the issue of climate change (**), the opportunity to profit from the shifting global energy mix is very attractive, if not historic. Consider McKinsey research which projects that the global energy storage market could be worth $90B to $635B by 2025, depending in part on adoption of electric vehicles. Or take a look at the figure below illustrating how Total, one of the world’s seven supermajor oil and gas conglomerates, is investing in energy storage, amongst its broader renewable energy investments (e.g., 66% ownership in solar powerhouse SunPower). ** We are not climate change scientists, but we defer to those who are: According to the US federal government (NASA), over 97% of actively publishing climate scientists agree that climate change over the past century is extremely likely due to human activity. Moreover, at least 18 of the world’s leading scientific organizations (e.g., US National Academy of Sciences) have issued public statements endorsing this position. When I speak to investors about the energy storage market, many are worried about technology risk. While the Energy Storage Association tells me there are over 70 battery chemistries being tested or deployed, research shows that there is just one dominant family of battery chemistries. Lithium-ion batteries made up 96% of all batteries installed in the US in 2015. More importantly, as the market demands batteries with longer duration, installations may shift away from lithium-ion, which are typically discharged in increments of seconds and minutes or perhaps two hours, to longer duration batteries, such as flow batteries. GreenTech Media’s projections below illustrate how investors may want to think about growth segments and technology as the market shifts from largely utility-scale installations to almost half of storage deployments taking place behind the meter. If industry soothsayers are correct, and the energy storage market today is where the solar market was in 2005, then we could see substantial investment opportunities in this sector. But do not jump in with both feet. Warranties, balance sheets, developer assumptions on revenue and cost, track record, and policy enablers all require an extra set of eyes. Yesterday, I published an article in the Real Assets Newsletter for Preqin, a global leader in market intelligence for the alternative assets investment industry, serving 40,000 investment professionals in 90 countries. See the link below. It's on page 8. "The Mainstreaming of Renewable Energy Infrastructure Investing - Risks, Returns and Emerging Sectors"
Figure 1 shows the attractive risk-return of infrastructure vs. other asset classes. Note that renewable energy made up 54% of all infrastructure deals globally in Q3 2016. Figure 2 illustrates that solar projects in the developing world tend to be larger (i.e., allow for greater volumes of capital allocation) and generate higher IRRs (albeit with more political and other country risks). It's time to look forward, not backward. Most perceptions about renewable energy are outdated because the sector is changing so quickly. Those wait run the risk of being late to the (raging) party. You may have heard of phrases such as “The Internet of Things” (IoT) or the “Smart Grid.” Both terms are defined differently by many people. The investment opportunities in improving the intelligence of our electricity generation, transmission, and generation system can be summed up by a joke reserved only for energy geeks (like me). Or consider the scale of the opportunity in the infographic below. Retrofits — IoT may impact brownfield (existing) energy assets more than greenfield developments. A “buy low, upgrade, sell high” strategy may be facilitated by these new technologies. Think about it like a real estate play of buying a Class B property, upgrading it, and selling it as a Class A space for top dollar. Branding — Some GPs may find that “smart energy” resonates more powerfully than “green energy” when discussing investment opportunities with new LPs. Ancillary supply chain investments — Real asset investors have unique insights into the projects they own. To maximize that knowledge, investors could begin investing in related IoT-enabled companies such as asset management, continuous commissioning, fault detection and diagnostics, security, safety, vehicle tracking, greenhouse gas analysis, metering, and video recording. U.S. Energy Storage Market to Grow 8x by 2020: What If It Had Its Own Special Tax Credit? Can the energy storage industry withstand the scrutiny of having their own ITC? It cannot be understated how transformative an energy storage ITC would be for the industry. At IronOak Energy, we have written previously on the impact of such an ITC, and even presented a positive take on its potential rollout. Here, I want to pose the question of whether the industry is really ready for such a game-changing policy. The graph above shows projections for the growth of energy storage development under the current policy regime. Not too shabby. But is the energy storage industry prepared to put that delicious tax equity to good use on stand-alone energy storage projects (in practice, solar + storage applications currently qualify for the solar ITC)? Of course, the answer is always: it depends. Depends on what? Some would argue that the critical issue holding back a tidal wave of energy storage projects is the technology. One could easily view the vast array of energy storage technologies vying for prominence with some trepidation. Some are commercially viable, while many are not. It takes some brainpower to suss out the contenders from the pretenders. Even the smarties at MIT have a tough time doing it. Do we want the government to incentivize the deployment of technologies that may not be ready to contend for the main stage? Conversely, is that precisely the role we want the government to take? ​This is a classic double-edged sword phenomenon. On one edge, there are green grassy fields of opportunity in rolling out new storage technologies in commercial applications. Accelerating storage deployment will drive down costs and help evolve viable business models. Beautiful. Lurking on that other edge is the distinct possibility that many storage technologies in earlier stages of development will simply fail. And failure is bad press, even if it is the Darwinian process of technological progress. It puts the government in the untenable position of having subsidized a “reckless” experiment with taxpayer dollars. “Picking winners and losers” they will say, even though an ITC is designed to avoid precisely this potential conflict. And, let’s just say that there is a history of nasty repercussions for such interference with the so-called free market for energy (ahem - myth). Solyndra - need I say more. Some will say that Solyndra was blown out of proportion (it was) AND it was 5 years ago (a lifetime ago in the clean energy industry). But now, the vengeful energy gods have gifted us SunEdison. It was an altogether explicable collapse, but one that, nonetheless, provides ammunition against government support for the clean energy industry. Who knows what would have happened with the extension of the solar ITC if SunEdison has filed for bankruptcy in 2015 rather than 2016. So, be careful for when you wish upon your industry the scrutiny of being a target of government support. Sure, risk exists with many energy storage technologies. Even the most established battery technologies lack the operational history to assuage the concerns of investors looking at decadal time horizons. If you are absolutely intolerant of risk, go invest in government treasuries (just kidding - terrible idea). Just running down the ladder to the cheapest storage technology fails to capture the complexity of the underlying value proposition. Cost is king, but there are many other factors competing for a role on the king’s court. Energy storage technologies cannot be reduced to a simple efficiency or production metric, as with solar or wind (even that is an oversimplification, but at least a reasonable one). There are more than a dozen potential services that could be generated by a given storage technology, many of which have few established market mechanisms to generate reliable revenue. So, here’s the central takeaway. The biggest challenge in the energy storage market is not how to choose the right technology. It is how to design the right market structures to support financial innovation. Making energy storage bankable is close to being a precondition for the successful utilization of an ITC. Recall that the success of the solar PPA model hinged on stable, contracted cash flows. Making solar bankable unlocked a vast market potential that we are still in the early stages of witnessing. There is no equivalent financial structure with energy storage, yet there remains a distinct need to create consistently financeable project cash flows. But wait, SolarCity and Tesla (perhaps soon to be joined in holy matrimony) pioneered a solar + storage PPA earlier this year. The energy storage industry needs a financial product the equivalent of a PPA, and perhaps we are not too far off. Thus far, it has taken a savvy, not mention risk tolerant, investor to back energy storage projects. There is only so much runway with this sort of approach. Easing the path for new investment in storage will hinge on making this inherently complex technology and market application simpler. There are already frontrunning markets generating experiences that will guide future market design and development - thanks, California. In tandem with this type of market development, energy storage needs a greater degree of standardization of financial strategies and structures to help make projects pencil. And not just for the smartest guys in the room, but for a broad swath of interested investors. The question remains as to whether an energy storage ITC will aid or inhibit such progress.